2. When suspension work is carried out. We have the lastest Cemb computer wheel aligner which is consistanlty up dated to the lastest specs. 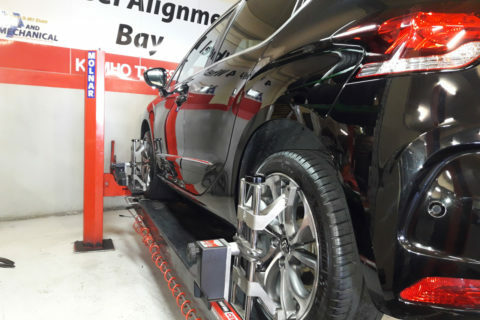 A Wheel Alignment consists connecting laser heads to your wheels and adjusting the angles of the wheels to specs for your vehicle. Save Money – Poor wheel alignment increases tyre rolling resistance which makes your engine work harder. Your fuel economy goes down and your tyres wear more quickly. It is highly recommended that you include a Wheel Alignment in your annual maintenance program. Tyres Last Longer – poor alignment will cause uneven tyre wear and drastically reduce tyre life. You may improve the tyre average life over 20%, making the exercise completely self-financing. Save Petrol – poor alignment increases the rolling resistance of tyres. About 30% of a vehicle’s fuel is used to overcome the tyres rolling resistance, and just a small amount of misalignment can increase fuel consumption dramatically. Savings of up to 5% on fuel can readily be achieved through accurate alignment. Improve Comfort of Driver – if correctly aligned the vehicle will run true, and the driver will not have to constantly fight the steering to keep the vehicle straight. This will help reduce driver fatigue.